Your Toothbrush Can Change the World! Posted November 27, 2015 by Heather Michet & filed under Crow Living. Having a bright, toothy smile is a gift and blessing to all: first to yourself, then to those you share it with. But the main helper that maintains that smile, i.e. your toothbrush, can be a little, dark curse on the planet. Brushes are best replaced every 3 months, for both hygiene and effective dental care. If not changed regularly, toothbrushes can become unsanitary from the buildup of bacteria from the mouth. Older brushes with splayed out and broken bristles don’t clean the teeth as well as newer ones. Over 1 billion toothbrushes are thrown away every year in the U.S.! may also be recycled after their 3 month life, depending upon your community’s recycling program. RADIUS Toothbrushes are made from biodegradable materials: once they hit the landfill, the cellulose fibers start breaking down. Brush with Bamboo has a bamboo handle & natural bristles – all of which biodegrade, leaving no trace. Replaceable Head Toothbrush: When it’s time to toss the old one and get a new brush, you keep the handle and replace just the bristle head. 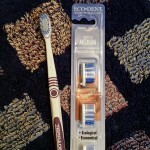 I’ve used the Eco-Dent Replaceable Head Toothbrush for 20 years and I love them. Change one thing in your lifestyle and change the world. Which “greener” toothbrush will you choose?